Google’s value just increased by $20 billion because of Google+, Google’s initiative to enter the social media marketspace. This means investors, although always measuring Google in regards to the search advertising revenue, see Google+ as adding a massive amount of value to the company. 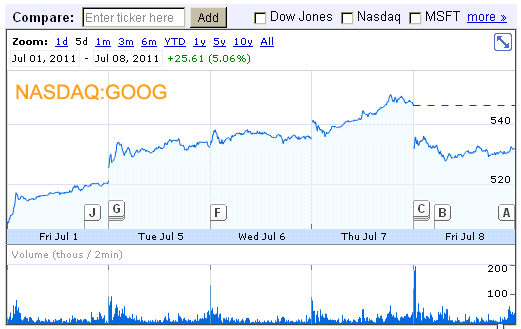 And then once Google+ was announced, the stock rose to close at $546.60 on July 7th. This equates to a $20.6 billion gain to Google’s market cap (with 322.25 million shares outstanding). Even better for Google is that Google+ is still in its infancy, running in a very limited beta release. Google’s stock price last week increased 5.06% to close at $531.99.